Few people today would take kindly to being called a Neanderthal. The name of this extinct human species has become synonymous with “stupid and rude,” and it’s not hard to see why. When we stand in front of museum dioramas depicting Neanderthals wearing little or no clothing, their hairy bodies crouched in caves, they seem so distant from us “modern” humans. They’re a different species after all, right? Yet the truth is, Neanderthals, like us, are humans. We’re related—distant cousins, you might say. Most modern humans have bits of Neanderthal in every one of our cells. Within the last decade, advances in genetic sequencing technology have allowed scientists to detect traces of Neanderthal DNA—remnants of mating between our ancestors and Neanderthals—in the genomes of people who are alive today. People of European ancestry, for example, are typically 2 to 3 percent “Neanderthal,” in DNA terms. In this episode of Base Pairs, we explore how genetic information can help us learn about human history. We go from the scale of a single individual who was murdered on a snowy mountain in Europe 5,000 years ago to interactions between large groups of humans and Neanderthals who lived 100,000 years ago. Along the way, you’ll find out whether you’re likely to have traces of Neanderthal in your own DNA—and maybe even gain a new perspective on what it means to be human. AA: Hello again, everyone! I’m Andrea Alfano, and I’m of course joined again by my co-host, Brian Stallard. BS: Hi, everybody! If you listened to our first two episodes, you know that on Base Pairs we like to look at the ways in which harnessing the power of genetic information has already shaped our world, and how genetic information is becoming an even more powerful tool today, as technology advances. AA: So far, our stories have been set either in the past or the present. But today, we’re really going to straddle both—because we’re going to be talking about using DNA evidence to piece together the past. BS: You’re talking about how we can trace DNA samples, CSI-style? AA: That’s part of it, yeah. Except I’m not just talking about matching the DNA to a criminal, like you might have seen on Law & Order. I’m talking about forensic investigations that reach deep into humankind’s past, matching bits of DNA across thousands of years. But, our story does start out with a murder. BS: Whoa… who turned on the drama? What did I just listen to? AA: Ha! I did warn you that we’re starting with a murder. What you just heard is from the trailer for a recent TV special called “Iceman Reborn” from PBS’s NOVA series. And that mystery man goes by the name of Ötzi these days. He was named after the place where he was found—high up in the Ötzal Alps, on the border between Italy and Austria. Some tourists found him sticking out of a glacier as they were hiking up a mountain back in 1991. BS: I remember. Ötzi was reportedly discovered by a pair of adventurers hiking those frozen peaks. AA: You can just imagine how bewildered they must have been. One moment you’re admiring the beauty of a snowy mountain range, the next, you’re standing over a frozen corpse. BS: An accident of global warming, perhaps? He was so well-preserved that they at first thought Ötzi had died recently. But it turns out they’d stumbled upon the oldest intact mummy that anyone’s ever found. LB: He’s got all of his parts, minus a few fingernails, but he’s got all of his internal organs. AA: That’s Lindsay Barone. She’s an anthropologist who works over at the Cold Spring Harbor Lab’s DNA Learning Center. LB: But, more interestingly, it appears that he was murdered. And so, trying to figure out what happened, he clearly didn’t die of natural causes, so what drove that? Why was he moving around the Alps with all of his belongings? He had an axe, he had clothing, he had a first aid kit—he had all of this stuff with him. So trying to reconstruct those movements and figure out what’s going on. AA: Lindsay knows so much about Ötzi because apart from the South Tyrol Museum in Italy—(BS: which is near where Ötzi was found)—the DNA Learning Center is the only place in the world where you can find an official Ötzi replica. BS: “Replica” really doesn’t do it justice. It was created by using an enormous 3D printer to make a mold, which was then filled with resin and painstakingly hand-painted. The artist even got to touch the real Ötzi to make sure he got certain textures right. KID: I saw the process on the television up there and it looked like it took a lot of work and effort. But I think it paid off because it looks really realistic. AA: This class is one of many that has travelled to the DNA Learning Center to learn about Ötzi. KID: Science today is so advanced that it can just get DNA out of pretty much anything. BS: Scientists have indeed sequenced Ötzi’s DNA, and have been able to learn quite a bit about him from it. KID: Also they can figure out everything like his eye color and his blood type, since obviously they didn’t find much blood. They could even find if he had heart disease or if he was lactose intolerant or not. AA: But what’s really cool is that high school students also get to learn about Ötzi themselves. For one activity, they get to sequence some of their DNA—(BS: that sequence is made up of the chemical base pairs in DNA, known by their initials, A, T, C, and G)—and compare their sequences to those of their classmates, other people from around the world, and ancient humans including Neanderthals and Ötzi. LB: So what they’re looking for is whether or not they have the same base pairs or whether those base pairs differ. And the more base pairs the students have in common with the sequence they’re comparing to, the more similar genetically they are. BS: It makes sense. Over time, the genome accumulates a bunch of random mutations. So if you’re only very distantly related to another person or another organism, you’ll have more differences in your sequences even if you’re looking at a gene that you share. LB: So Ötzi is very, very similar to the modern European reference sequences. A lot of students tend to be very similar to Otzi as well. AA: When the student compare their sequences to those of Neanderthals, though, they start to see more differences. Neanderthals and humans went their separate evolutionary ways around half a million years ago, and are considered a different species than the humans that are around today. KID: List the differences between the Neanderthal and human skulls. I feel like their skull was bigger than the human—yeah, bigger skull. And their ribcage was a little bit bigger. But they’re actually pretty similar. BS: At the DNA Learning Center, models of human and Neanderthal skeletons stand side by side so that you can compare their physical features. And even after a half million years apart, the similarities are striking. KID: It may seem old to us but for the history of like humans, it’s really not that old. AA: He’s right. Half a million years isn’t all that long in evolutionary time. In fact, humans and Neanderthals weren’t even truly apart for that entire time—since they were so similar, they could and sometimes did mate with one another. Most of us even have traces of these encounters in our DNA. LB: Modern humans that are not of recent African origin tend to have between one and four percent of their DNA from Neanderthals. Depending on the ancestry of the student or the ancestry of the individual that is being compared to the Neanderthal, there might be a few more differences or not quite as many. BS: Our textbooks tells us that modern humans—Homo sapiens—and Neanderthals are different species, but they’re still close enough to have offspring together. Then what makes them different species? AA: That is a very good question. AS: So this gets at a kind of a skeleton in the closet in evolutionary thinking. AA: That’s Adam Siepel—(AS: professor at Cold Spring Harbor Laboratory and Chair of the Simons Center for Quantitative Biology)—and I asked him that question about modern humans and Neanderthals. AS: We don’t really know what a species is. We could argue about whether they really could be called separate species and some people indeed argue that they should all be considered members of the same species. BS: Wow, even people who study this stuff for a living are confused about this. AA: It can be confusing. But, all of that seemingly chaotic gene swapping—(BS: you mean mating)—yeah, all of this mating of modern humans and Neanderthals actually helped Adam and his team discover surprising new parts of the history of humankind. AS: We found evidence of an earlier migration out of Africa, resulting in gene flow— interbreeding—between modern humans and Neanderthals some 50,000 years before people generally think of modern humans having emigrated out of Africa at all. BS: So modern humans started out in Africa, and eventually migrated out and explored other parts of the world—that’s the famous “out of Africa” migration. 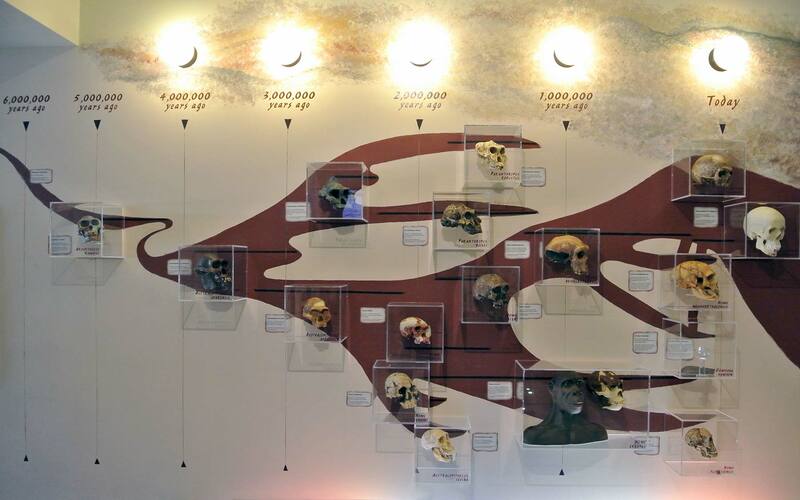 And now Adam is saying that wasn’t the first time modern humans left Africa? BS: What kind of evidence? Ancient bones? AA: Yes—well, Adam’s team didn’t discover the ancient bones. They just work with genomes, and they were able to get the genome of a Siberian Neanderthal from another group of scientists. Adam’s “laboratory” is essentially a collection of desktop computers in an office, connected to some very powerful supercomputers. He does experiments by gathering genome sequences and crunching numbers to compare them and learn about them. AS: I’m also fascinated by the idea of using powerful statistical and mathematical and computational tools to sort of decode this hidden level of meaning in genome sequences to be able to get at these secret stories by being clever enough in the way we decode them. BS: It’s kind of like that activity the kids were doing before at the DNALC, where they compared their sequences to those of Ötzi and Neanderthals to see where the base pairs differ. Adam’s work seems like that, but all grown up. AA: Right, it’s a lot like that. So Adam and his team were working with this Siberian Neanderthal genome, and three other ancient genomes—two are from Neanderthals who lived in Europe, and one from another species of ancient human that was also living in Siberia. And they compared these ancient genomes with sequences gathered from modern humans with different ancestries. AS: What we do is we build what we call genealogies—they’re sort of like family trees that are describing the relationships among these individuals across the genome. BS: So Adam is building a family tree that goes back tens of thousands of years, but he’s only got a few family members within a giant family to work with. That sounds kind of impossible. AA: It is pretty amazing. It’s important to keep in mind, though, that these family trees don’t show direct relationships between individuals, all of the mothers and fathers and children along the way. The individuals whose genomes Adam analyzed sort of served as representatives for large populations of humans. BS: So it’s a tree that shows when different populations of humans separated from one another. AA: Right. And they can tell how much time passed between these separation events by looking at the sizes of chunks of the genome that are similar between these individuals. AS: We can use that as a clock when we try to date these ancient events. So, for example, your parents have fairly large chunks of DNA from your grandparents, right, but smaller chunks of DNA from your great grandparents and even smaller chunks of DNA from your great-great grandparents, and as you go back many, many generations, those chunks get smaller and smaller. AA: When they compared the Siberian Neanderthal’s genome with those of modern humans from today, they saw something that really surprised them. BS: Like what Lindsay was talking about earlier, how students with certain ancestry had more similarities to Neanderthals. AA: Right, those are a lot bigger, on average, than the chunks of modern human DNA that Adam and his team found in this Siberian Neanderthal’s genome. BS: Ohhhh, so that means that the encounter that left modern human DNA in the Neanderthal genome happened a lot earlier than the encounter we already knew about—the one that left little bits of Neanderthal DNA in our own genomes today. AA: Yep. Since this unexpected genetic trace of modern humans showed up only in these Neanderthals who lived in Siberia, Adam and his team proposed that a group of early modern humans, who are now otherwise lost to history, left Africa a lot earlier than the previously know “out of Africa” migration 50,000 years ago. And that conclusion held up when Adam’s team put it to the mathematical test. AS: These methods are quite intensive—some of our programs will run for two weeks or more on a computer cluster involving hundreds of compute nodes. BS: But if we know that humans and Neanderthals had children together at least a couple of times, does that mean it happened many more times that we don’t know about? AA: That we can’t say for sure. But we do know that those human-Neanderthal hybrid children went on to live among humans and Neanderthals and seemed to be accepted just fine in both communities. AS: What I think is really interesting about our finding is that it suggests both of these events occurred. Human-Neanderthal hybrids were absorbed both by modern human and by Neanderthal populations. I think it’s very interesting, and in some ways it’s sort of encouraging about us all being one big happy family, maybe more so than people have recognized. BS: A big, happy, human family. That is pretty encouraging. AA: Right? I think so. The students at the DNALC pick up on this, too, when they realize how genetically related we all are. LB: It’s one of those things that I think really helps clarify their position with respect to all of these people that came before them, with respect to other people that are living now, with respect to the Neanderthals and other species—you know, they get really excited about being able to make those connections for themselves. The replica of the 5,000-year-old mummy called Ötzi that is on display at CSHL’s DNA Learning Center took a CT scanner, a giant 3D printer, and a lot of hard work to create! The video below shows the whole process in just a few minutes. Earlier this year, PBS aired a NOVA special about Ötzi that follows the making of the Ötzi replica that’s now on display at the DNA Learning Center. 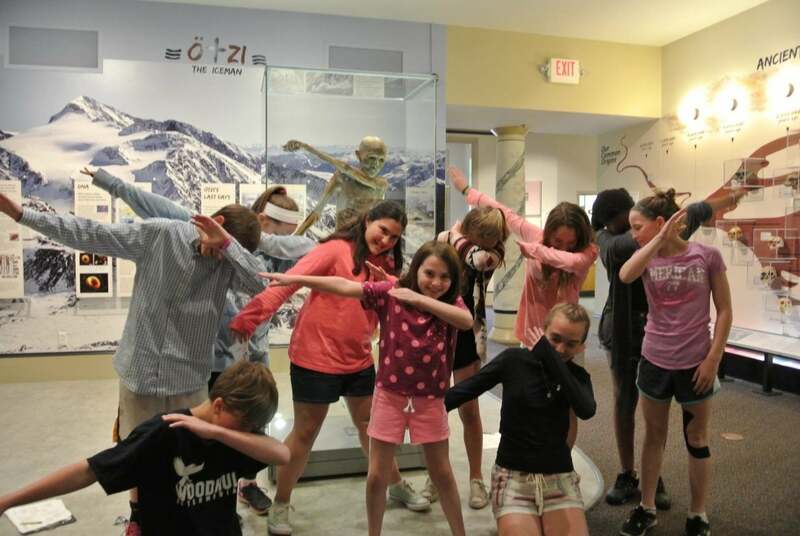 The students, pictured below, who were visiting the DNA Learning Center on the day that we recorded this episode were thrilled that Ötzi seemed to be stuck doing a popular dance move: the dab. Watch Adam Siepel, in the video below, give an overview of how he and an international research team used several different methods of DNA analysis to find what they think is strong evidence of mating between a Neanderthal and the ancestor of a modern human—a mingling that occurred tens of thousands of years earlier than any other such event previously documented. Thanks, National Grid Foundation for hands-on science!